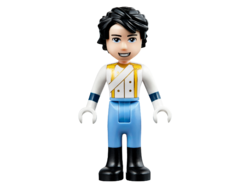 Prince Eric is a Disney Princess character released both as a DUPLO figure and a mini-doll figure. Prince Eric has dark tousled hair and green eyes. Eric has a white torso with a small bit of flesh showing at the top and buttons going down to a brown belt with a golden buckle he also has white arms and flesh hands. Eric has unprinted blue legs. As a mini-doll figure Eric wears a white tunic opened with a red belt and blue trousers. He has wavy black hair. Eric is curious about merpeople. Later that night,when Eric is on a ship but he is saved by Ariel, she brings him to shore and sings to him, but before he can regain consciousness fully, Ariel leaves when she sees Eric's friend approaching them. Eric keeps remembering Ariel's voice. When he sees Ariel again, she has traded her voice for legs, and though he initially finds her familiar, he doesn't notice she's the girl who saved him because she's missing her voice. However, he brings her back to his palace and they spend time together. During a boat ride, the two come close to kissing, but gets interrupted by the evil with Ursula's slaves. Before he can approaches Ariel again, Ursula, disguised as a human girl named Vanessa, arrives and uses Ariel's voice to hypnotize Eric into believing she is the girl who saved his life and to forget all about Ariel. Eric almost marries Vanessa, but before the vows are completed, Ariel's friend Scuttle leads a group of sea creatures to stop the wedding. During the chaos Ursula loses Ariel's Voice. Ariel's voice is also restored, making Eric realize that Ariel is the girl he has been looking for. Before they can kiss, the sun sets and Ursula kidnaps Ariel. Eric follows them, diving into the sea to help Ariel. In the battle that follows, Eric saves Ariel, Eric manages to reach the shore, and when he wakes, he sees Ariel, transformed back into a human, and the two embrace. They get married and live happily ever after. This page was last edited on 17 February 2018, at 08:45.